This afternoon came with some very sad news, Michael Bond the creator of Paddington Bear and The Herbs has died aged 91 following a short illness. Best know for writing, nurturing and bringing to life Britains favourite bear, Paddington, he has bought joy to millions of children and adults across the globe. The Paddington stories have never been out of print since their first publication in 1958 and have spawned many further creations including a hugely successful film, of which a sequel is being created as we speak, and more fondly a stop motion children’s show in 1975. I walked out tonight into the bright light of the full moon. We have, over the past few days, experienced a wonderful full moon and lunar eclipse. During this time we have been getting connected with our intuitive energies. Our ability to connect the head with the heart. Pisces is a very emotional and intuitive sign. We need to get ready for some big shifts in our lives. Processing painful memories can be very fruitful now. This is a positive time for people in general. It’s a good time to deal with issues and have an emotional clear out. The Lunar Eclipse was on the 16th of September and the vibrations from that continue to be felt. This is a cycle of completion and closure…an opportunity to move on! This full moon is also about release. Eclipses are often linked to accelerated development. Our summer house and production centre! Patch as he was in later life! Dad, Patch and me in February 1969! 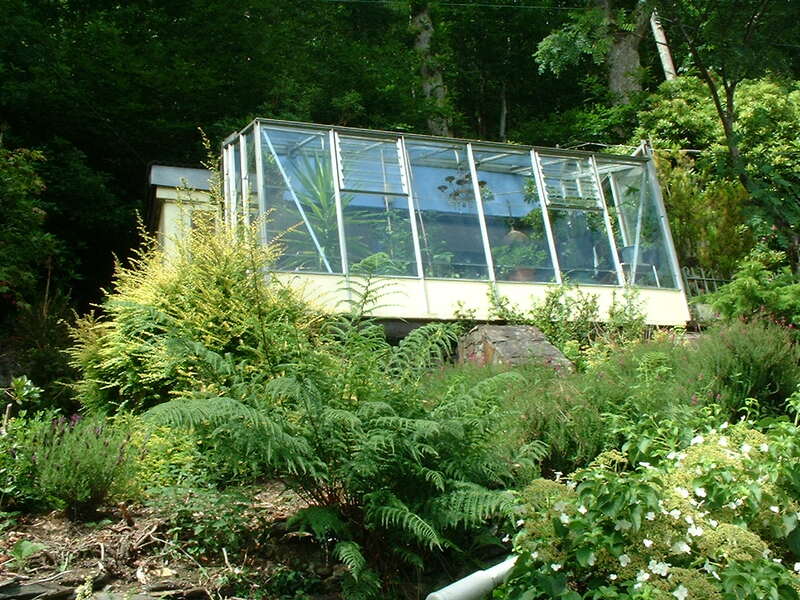 I bought eight Dolly tubs full of plants from a bakery that was closing on Angelsey around four years ago. All eight for twenty pounds! The only downside was, I had to fetch them!! 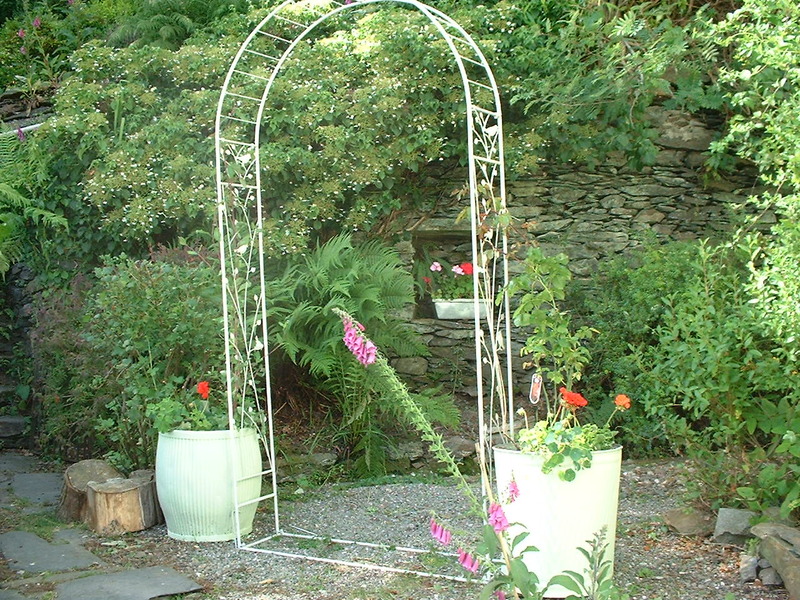 Boy, were they heavy.I have used two at the side of the arch , which came from our shop, Summer Strawberries in Barmouth! Today is a fresher,sunny day and just the sort of day to get out into the garden and make tidying progress! With four Dachshunds as ‘helpers’ it takes twice as long…but I wouldn’t be without them! We have had Dachshunds for thirty six years.Mostly wire haired miniatures. We did have a Basset in the eighties as well….would love another! When I arrived in the world, back in the fifties there was already a dog present. Penny was a mongrel whose mother was a sealyham terrier. She soon made it clear that she was not about to give up her pouffe to this interloper! Later in the sixties, I had a spell in hospital. 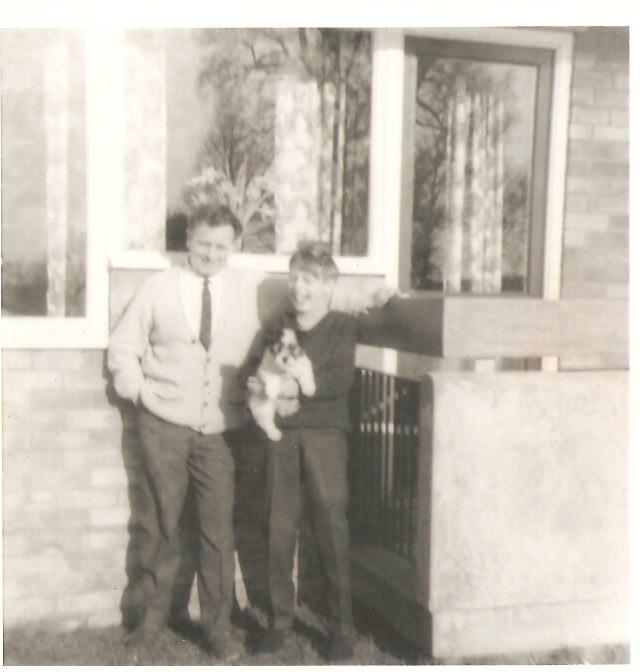 When I was discharged I arrived home to be presented with a ‘Jack Russell terrier..although, Patch looked more like a miniature old English sheepdog, a breed that my dads aunt had bred. It’s a cool evening too. I’ve lit the stove and the kettle begins to sing on the top. It’s a tea and toast kind of evening. I was thinking about Fairies today as I walked through the Fairy Wood. 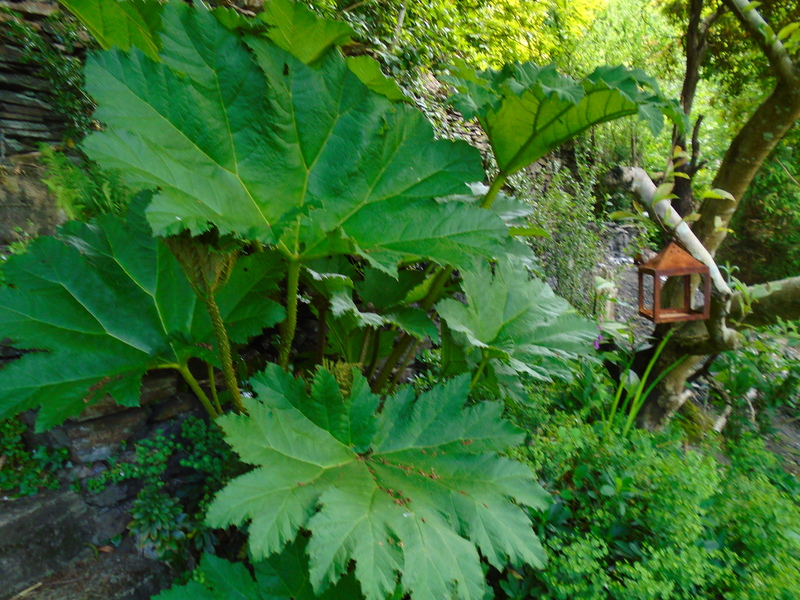 It lies below the cottage, in a natural dell and is a very special place. There’s a Fairy tree in the centre of the woodland with a huge stone underneath it’s branches. I’ve often wondered about the history and meaning of that tree and stone. Hello and thanks for stopping by. Occasional post about life in the country. 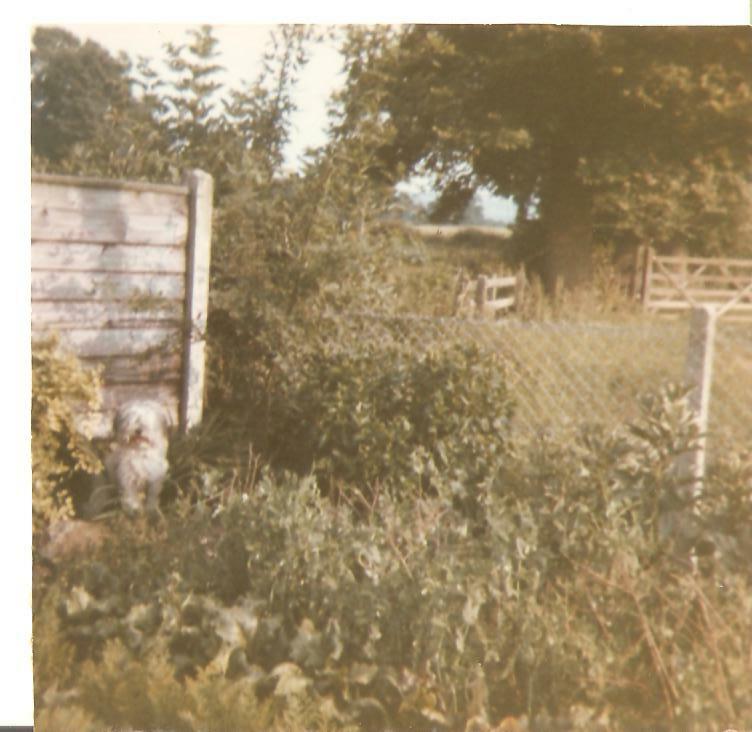 I was born in the southern tip of rural Warwickshire to a farming family.A fabulous fifties childhood. Trying to recreate ( as best as modernity allows) that life in Meirionydd, Gwynedd.